As I covered yesterday, in very brief summary, Google's Matt Cutts told us ten SEO changes coming to Google by the end of this summer. One of those changes is softening the impact of the Panda algorithm for sites that are in the "gray area" or "border" of being impacted by the Panda algorithm. 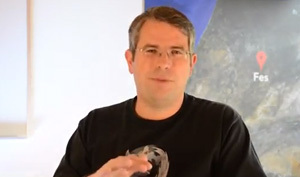 Matt Cutts, Google's head of search spam, said 5 minutes and 3 seconds into the video that Google is adding additional signals to look for other quality metrics that may lessen the impact of the Panda algorithm for those sites in the gray area. This is with a caveat! We are looking at Panda and seeing if we can find some additional signals, and we think we've got some to help refine things for sites that are kind of in the border zone, the gray area a little bit, And so if we can soften the affect a little bit, for those sites, that we believe have got some additional signals of quality, that will help sites that were previously affected - to some degree. The question is, what "degree" will these sites see a benefit in ranking after the Panda algorithm is softened for them? That is the big question. So I screen captured Matt's facial expression when he said that and see what I mean? Will this have much of an impact or just a very soft impact on those who have been impacted by Panda? I am not sure. But it will be interesting to follow and see what happens over the next few months. Matt clearly said the Panda algorithm will be softened for some but the question is, how much so?